At 6.15 it rains. Not unexpected. But soon it stops and it seems as if the sun is shining it gets hot in the tent. When I have finished breakfast, I decide to get the tent down while I'm in dry weather. Everything has gradually moved into the "dining room" and outside there is a shed where the bike can stand while I load it. A wise decision it shows. Just as I'm about to get on my way, the rain starts. I have about 65 km ahead of me, but have always been set to rain today. Goodbye Adalsbol - and your lovely bathroom. As I am leaving, there are also a team of guests who have stayed inside that are leaving. They speak an Eastern European language. "Is that Czech or ...." I say. Yes, it is, how could you tell, says one of the women happily. It did not really sound Polish so I guessed. We exchange some experiences. They have rented these 4WD in Keflavik just like many others. I think at least every other car you see is a rental car. I've been inquiring about the roads around here, and have not decided yet. Want to see what they look like. It rains between hours all morning. Never fierce, more a light rain. When I come to Brú, there are two possibilities. The right should be the easiest, the other the shortest, but that goes steep up for a while. The other just a little, he said. If I knew what I know now, I would have taken it short one. It's easy to be wise afterwards. 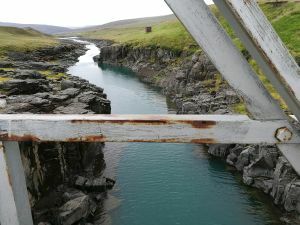 I'm going through Eriksstadir, which has 2 houses like Brú. But also a church. Even, the smallest I've ever seen. There are some boring climbs and the wind is in my face. But the road is fine. Through Eriksstadir even paved. This repeats itself in the next town, which has 4 houses, but no church. There should be 40 km to Road No 1. When the valley becomes narrow, you typically get a climb and that happens several times. The rain is gradually ending. I reach the Ring Road, which I have been able to see for a while. Not completely, because now I have to choose. Either I take the trip all the way down to it, having to go up the height meters again, as the Ring Road is going up over a ridge. 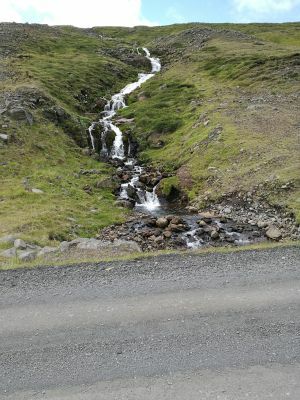 Or I will stay on this road, which, in accordance with the map, goes parallel to Road 1 so as to join it further ahead. I decide the latter to save the altitude meters - and curse it later. 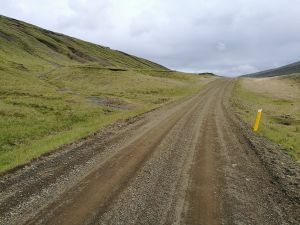 Partly, this road does not have the same steady rise as the Ring Road, and this piece is apparently not maintained as well, as any driver with the brains will prefer to get as fast as possible on asphalt, whether down or not. Well, at last I get to a nice asphalt. Unfortunately, I've also come across a road that is COMPLETELY open. And the wind seems to come straight from the North Pole. Cold and violent. It is not a direct headwind, but I only drive 9-11 km/h for ages. I do not feel I'm advancing at all. The hours pass. I had hoped to reach somewhere further ahead on the Ring Road, it will be impossible. 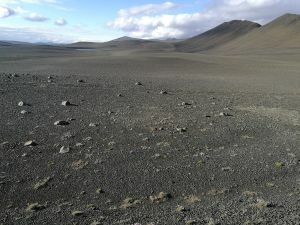 Only option - if I do not want to pitch a tent in the windy wilderness - and there is really NOTHING - is to drive down to my original goal Mödrudalur from the north. There can be no more than 10 km from No 1. Finally, I'm lucky: the road turns, to stay at that angle. I suddenly get up at 16 - 20 - 24 km/h. And just as I get into a moonlike landscape - now there's neither moss nor lichen nor grass - there's a L-O-N-G downhill. I have obviously been driving up for a long time. With more than 60 I'm rushing down. And in less than an hour, I reach as far as in the previous 3.The sign arrives: 8 km. I'm back on gravel but of good quality and swings up at the cafe in front of the camping area at. 20:00.